Since moving to Japan, I've been told one thing I need to do (in addition to climbing Mt. Fuji) is attend the Sapporo Snow Festival. So I took four days leave and paid my money for the February tour. Sapporo is the capital city of Hokkaido, the northernmost of Japan's main islands. With a population of 1.8 million, Sapporo is Japan's fifth largest city. It hosted the 1972 Winter Olympics and will host the 2002 soccer World Cup. Rare for a Japanese city is the orderly grid of Sapporo's streets; all are numbered and evenly laid out. (One frustration about living in Japan is the lack of street names and road maps.) Our hotel was located at North 5 West 7. We were given street maps and could easily find our way around town. Sapporo's street scheme resulted from the influence of foreign advisors when the Japanese government colonized Hokkaido in the late 1800s. The Old Hokkaido Government Building is another example of foreign influence. Built in 1888, its red bricks and octagonal dome reflect the architecture of the Massachusetts State House. 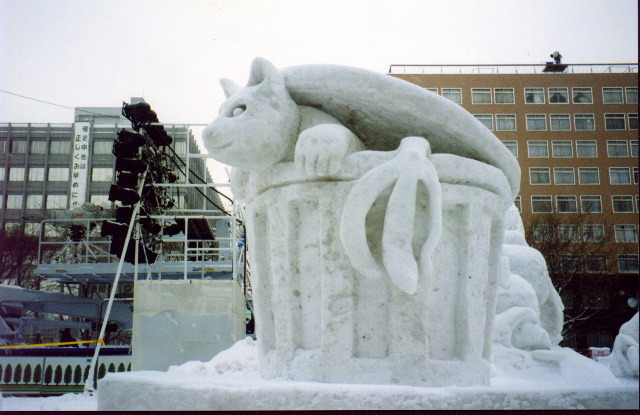 The Sapporo Snow Festival began in 1950 when high school students made six snow statues in Odori Park (which stretches from West 1 to West 12 streets). In 1955 the Japan Self Defense Force began building massive snow statues. Because there isn't enough snow in Sapporo itself, as many as 8000 five-ton truckloads of snow are brought in each year, beginning three weeks before the festival. The largest snow statues take about 2000 cubic meters of snow. A wooden frame is built and filled with tightly packed snow. When the snow hardens, the frame is removed and the carving begins. Shovels are used for the rough shaping of the statue and special tools for the finishing touches. One house-sized sculpture commemorated Japan's recent defeat of Iran in the qualifying match for soccers 1998 World Cup (to be held in France this summer). This "Dream Kick-off" sculpture took 26 days and 545 truckloads of snow, and was built by 1537 members of the Ground Self Defense Force (Japans army). Great Britain's section contained a 49-foot-high sculpture of St. Paul's Cathedral, as well as a double-decker London bus. France provided a series of ice sculptures, which were breathtakingly beautiful at night when lights shone through them: Tour Eiffel, Arc de Triomphe, Pantheon, the Louvre and a statue of Napoleon. Sunshine alternated with cold breezes and lightly falling snow during our entire visit. The temperature hovered around 25 degrees. We saw all three sections of the snow festival--the twelve blocks of Odori Park, an ice festival in Susukino, and snow slides at Makomanai Park on the Ground Self Defense Force base. One section of Odori Park, called Citizens Square, contained smaller statues (about eight feet square and ten feet tall) built by various groups of workers, families and students. There were numerous animal statues, as well as a head consisting of an open mouth with sharp teeth, a face with its tongue sticking out, a sumo wrestler's backside, a hand holding a telephone, and Batman. Many of these were obviously supposed to be humorous. We watched ice sculptures being made in Susukino. Workers stacked long flat blocks of ice and shaped them with chain saws, files and electric drills. The horizontal lines in the delicate-looking finished sculptures gave texture and left evidence of where the blocks had been joined. Our first evening we had supper at the Sapporo Beer Garden, a nineteenth century red brick building. Each table contained a dome-shaped cast iron plate heated by a gas burner. We fried vegetables and slices of mutton, constantly moving them with our chopsticks so the pieces didn't burn or fall off the plate. This meal, Genghis Khan, was the house specialty. Waiters brought a steady supply of mugs of beer, which I assumed was Sapporo beer. Painted across one entire wall and also hung on banners suspended from the ceiling were the words, "Morgens mittags abends nachts trink dein bier und sonst verachts." We asked two Japanese employees what the saying meant and they had no idea. One seemed surprised at our question, as he said, "But it's in English." We told him the letters were the same but the words were different. I think the sign said something about drinking beer morning noon and night. We concluded our tour at Makomanai Park with its giant slides. The Royal Netherlands Palace served as a backdrop for the main stage, and the slides represented Japanese television characters and the Wizard of Oz. The snow and cold of Sapporo made me wish I was headed to South Dakota instead of back to Atsugi.